Pancakes may seem like a breakfast basic but in the hands of California’s culinary creative types, pancakes are anything but. 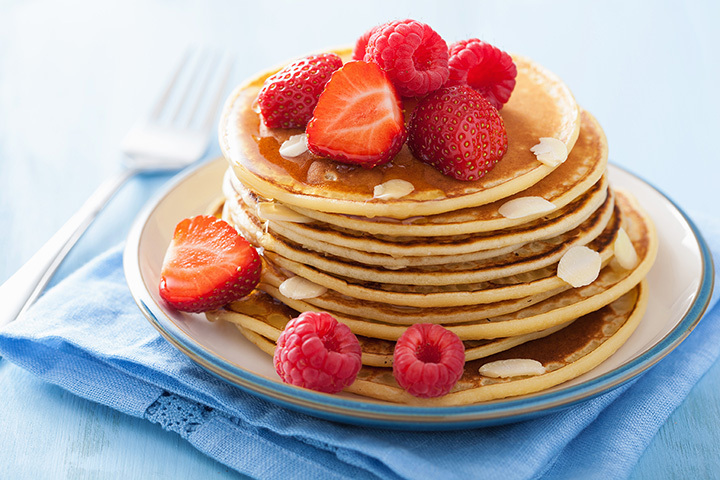 Stacked super high, made extra fluffy or super thin, filled with unique toppings and stuffed and griddled, pancakes are surprisingly versatile. Many restaurants even offer gluten free or healthful takes on the popular breakfast carbohydrate. From traditional buttermilk to a short stack loaded with chocolate chips, here are the 10 best places for pancakes in California! Cici’s Café has an expansive brunch menu but much of the focus is on pancakes. You’ll find a mind-boggling variety of pancakes that are both sweet and savory or sometimes both. The pancakes are the size of a large plate or small platter, so show up hungry. The all-day breakfast spot has been a favorite for years and generations show up on weekends to wait in line for some of the best pancakes in town. Order pancakes all by themselves or with traditional breakfast meats or go for something unexpected and get one of the pancake combos, choosing from anything from fried chicken to salmon croquettes at the revered Southern diner. The Gridldle Café can’t be left out of any list of the best pancakes in town, which are also considered the best in the nation by some publications. A hip take on a traditional breakfast diner, the Griddle Café is most famous for its red velvet pancakes, but you can also get pancakes with breakfast cereals or topped with desserts. The lemon ricotta pancakes have a reputation for being some of the best you’ll ever have. Enjoy them solo or as part of the hearty Plow platter. Given the location, there is also a gluten-free pancake option, made with almond flour. Fresno’s Batter Up Pancakes is a baseball-themed family restaurant that is really into pancakes. Choose your batter (buttermilk or whole grain blue corn meal) and then decide whether you want to try something sweet like the cinnamon roll pancake or have your breakfast sausage cooked into the batter. Jim Denny’s is a classic diner that makes a great hamburger and chili and does a remarkable job on pancakes as well. Choose from the supersized hubcap pancake or the mini pancake short stack. If you are up to the challenge, try eating the Hubcap with spokes in 20 minutes or less for a $20 gift certificate to your next visit. Tower Café is an international taste of cuisine. The breakfast menu is a local award-winning favorite, thanks in part to the New Mexico blueberry cornmeal pancakes. Pancakes and breakfast are available daily, with longer hours during weekend brunch. The tiramisu pancakes seem closer to dessert than breakfast but if you’re craving something sweet, they will more than hit the spot as they are topped with espresso maple syrup, mascarpone and chocolate sauce and finished with cocoa powder. There are other pancakes too, but the tiramisu are by far the most decadent. The Silver Dollar Pancake House looks like an old-fashioned diner, but the pancakes are anything but. A full page is devoted to different batters and toppings, including a cornmeal batter topped with chili. There are also other pancake versions, ranging from pecan to crepes to potato. Louisa’s Place Restaurant has become an SLO favorite in the 40 plus years it has been in town. Part of the attraction for locals and visitors are the pancakes. Buttermilk, sourdough, gluten-free and other batters as well as chocolate chip variation are all good choices, whether you enjoy a solo stack or make it a combo.